Last year at this time, I ran down a list of the ten boardgames I’d played most frequently in 2016. It was not, to put it bluntly, the most well-read piece in the history of this site. But a few of my pals with similar affections for cardboard bits and wooden pawns did write in with some enthusiasm, and a few strangers with their own lists of boardgaming favorites sent recommendations. A few of those are now where the Christmas tree used to be. It’s a small hobby, at least in America, but those of us who are involved in it tend to be passionate about it. So because I like traditions, and year-end recaps, and making much ado about meeples, I’ve decided to do it again. In 2017 we made a commitment to try games we’d never played before. Half of the titles on this list are new arrivals, and two others are games that landed in our collection sometime in 2016. We refashioned our living room in a manner that gives our boardgames pride of place along with the books; sit on the sofa, and our forty or so boxes are what you’re going to see. As home entertainment centers go, it’s prettier than a flat panel screen, more interactive than your grandma’s curio cabinet, and it functions perfectly well in a brownout. The particular games we play are called as Euros (boardgames are broken down into more subclassifications than heavy metal) which means they tend to be peaceful affairs without many random elements and virtually no chance of player elimination. American games are heavy on theme and simulation and often come with tiny, meticulously sculpted replicas of tanks, or money, or star-cruisers. Euros are more abstract and mathematical, and turn on mastery of intricately calibrated gaming mechanics. You may be encouraged to think of a colored cube as cattle, or currency, or a civilization of thousands. In ’16, Hilary and I were enchanted by a fast-paced card-swapping and chip-grabbing game — heavily recommended by the baseball columnist Keith Law — called Jaipur. Part of the reason we played it so much: it fits in a box not all that much bigger than a portable speaker. We could, and did, throw it in travel bags and play in airports and hotel lobbies. None of this year’s games, alas, are small enough to travel with. To play these, you’ll need a table, and time, and some dedicated players. Desire to build a farm, or a cloister, or a city, and see in flourish in spite of obstacles — that helps, too. #10. At The Gates Of Loyang This is an early game made by a favorite designer named Uwe Rosenberg who, it has to be said, is obsessed with crop growth. Sheep, too; Loyang is the rare Rosenberg game that’s sheepless. Uwe Rosenberg has made many games, but he’s still probably best known for Agricola, a punishing medieval farm simulation that is tons of fun if you can handle the constant threat of famine. At The Gates Of Loyang is sometimes considered the weak sister in Rosenberg’s so-called Harvest Trilogy, which also includes the shipping empire-builder Le Havre. I understand why some gamers call this one unspectacular, but we don’t agree with their assessment: it may not share Agricola’s devilish complexity or multiplicity of outcomes, but it’s pretty quick, it’s beautiful, and it’s the rare Euro designed to accommodate two players. In Loyang, you’re a Chinese vegetable farmer whose objective is satisfy the demands of a procession of customers with various produce desires. On your turn, you’ll be scrambling for ways to obtain different vegetables and fields on which to plant them, and, if all goes right, sending the customers home happy. Sometimes that’ll happen by the skin of a lima bean — you’ll manage to activate the right farm laborer to procure you the right vegetable to swap for another right vegetable to prevent your clients from expressing dissatisfaction and losing you money — and when it does, it’s extremely satisfying to pull off. There’s a card playing and bluffing element in the game where you’ll be making certain resources available to your opponent, and a certain amount of gambling necessary: it will sometimes be advantageous to draw cards blind from a deck, but woe betide the farmer who draws a customer who demands a hard-to-acquire leek at the wrong time. But mostly the joy here comes from plopping the little wooden vegetables down on the fields as they bloom, and then harvesting them and delivering them to the customers. Like all Uwe Rosenberg games, the immersive quality is augmented by twee cartoons with a touch of Herge (in this case, Lotus Bleu) and maybe a bit of Richard Scarry, too. That might not fire your tank engine if you believe it’s beneath your dignity to be a humble turnip salesman. But my local grocers are my personal heroes, so this is right up my alley. I only wish I could acquire clementines and pomegranates with the grace and skill of the crew at P&K Fruit Market on Newark Avenue. Some people like to make believe they’re generals or quarterbacks. I like to pretend I can get it for you wholesale. #9. Puerto Rico A classic of the Euro genre — one we used to play all the time in the mid-’00s. We’d put it in drydock a few years ago after it began to bug me that the third player to go had a small but noticeable advantage over the first two, and I was unable to devise a house rule that might rebalance the scales. It was Hurricane Maria, sad to say, that prompted me to pull it back out: I thought of the Morro and Viejo San Juan, and the long history of Caribbean storms, and the next thing I knew, I was lining up the plantation commodities and loading the, um, “colonists” on to the “colonist” ship (more on that in a moment.) Our 2017 games of Puerto Rico were, again, disproportionately won by the third player, but that didn’t stop it from being fun. Puerto Rico is notable for its unsurpassed implementation of the role-selection mechanic that isn’t uncommon in Euros — one player picks an office, say, the mayor, or the trader, and then all players must carry out the action associated with that role. This makes Puerto Rico an exercise in mind reading. Not only must you time it so you are in the best position to take advantage of the role available to you, you also must anticipate the roles the other players are likely to take, thereby making hay on their turn as well as your own. In practice, it’s impossible to anticipate everything that’s going to happen — especially when the player count reaches five — so you’ll constantly be revising your tactics, improvising on the fly, and rueing the day you chose to sit next to a friend who keeps wrong-footing you with counterintuitive role selections. The theme of the game is farming and shipping in the colonial era, and you’ll often have the option to acquire new plantations and buildings that improve your position and score, and manufacture commodities like corn and coffee for resale in the Old World. These can be stockpiled until somebody calls Captain — at which point there’ll be a mad scramble for limited space on the Spanish galleys, and anything that doesn’t fit will need to be stored or it’ll rot in the tropical heat. Now, in order for any of your buildings or plantations to function, they need to be staffed, and the person who cuts the sugar and processes the tobacco is represented by a little brown disc. Also, he comes from overseas in a crowded boat, and once you can’t get these “workers” anymore, the game is over. If you know anything about American history, you also know what’s being depicted here, and it might make you more than a little uncomfortable. Euro designers: not always in tune with legitimate New World sensitivities. #8. Scythe This was a Kickstarter-funded game, and like many Kickstarter projects, Scythe is distinguished by the detail and high quality of its components. Inside the mammoth box, along with dozens of cubes and meeples and beautifully illustrated cards in a style that borrows from steampunk, are statuettes of warriors riding battle beasts and inch-tall plastic mechs with fearsome toy weaponry. So this is a wargame, you might reasonably think. Only it isn’t, not really. Battles do occur on this alternate-history map of Europe, but they’re ancillary to the real action, and they are, by far, the least effective part of Scythe. Most of what you’ll be doing on your turn may be familiar to you from other Eurogames: methodical exploration to find new resources and conversion of those resources to buildings and upgrades that will let you process those resources more efficiently. Eventually the empire you build and the secret goals you hold will cause you to bump up against your neighbors’ designs, and when it does, the conflict that ensues will be resolved through a wholly unsatisfying system driven by a scale on the board and a deck of cards with a limited range of values. This means that outcomes are almost never a surprise, and while that may be true to the experience of Cold War commanders, it doesn’t make for an exciting component of a game that leads with its teeth. The shame is that the rest of Scythe is really fun if you like slow-moving Euros (we do). A lot of what works here mimics Terra Mystica, one of my absolute favorites. Each playable nationality has unique powers, and each major upgrade unlocks new abilities specific to your faction. Some of these are, again, the sort of thing that might get you in trouble with your local anti-defamation league, i.e., the Germans win points for aggressive play, the Crimeans, who are sort of Arabic, are shifty, sharp-eyed traders, Poles are friendly, Norwegians love to swim, etc. None of this stuff was necessary to make Scythe run, and since this is an alternative history, the designers can and do take all sorts of liberties with the background anyway. It’s there, I think, because the Kickstarter audience values worldbuilding; in fact, it’s possible to go on to the Scythe website and learn more about the postapocalyptic (I think?) scenarios and the characters depicted by the statuettes. Only nothing about the gameplay compels me to do this. What’s engrossing about Scythe, like all Euros, is the turn-by-turn puzzle-solving element that motors the mechanics, not the characters in the game. I can admire the intricacy of the art on the token, but I’m really no more curious about the Russian woman with the pet tiger than I am about the backstory of the hat in Monopoly. I’m overemphasizing the problems; Scythe is an engaging game and I expect to keep on playing it. But when I do, it’ll be for the features common across Euros. I don’t think that those features were novel enough to sell the game on Kickstarter, so it probably became necessary to add some window-dressing redolent of American deep-theme boardgames, wargames, and RPGs. If you’re looking for any of that, you’re not going to be satisfied. Don’t believe what the box and the pieces promise. #7. Fields Of Arle This is another Uwe Rosenberg game, and you’d be forgiven if you thought that it had been stamped out of the Uwe Rosenberg factory. Many of the elements familiar from the Agricola series of games are here: wheat to plant, sheep to herd, a blank green space to develop into a farm, buildings to add to a grid and workers to send out to the fields to bring home resources, a complicated array of resource conversions, etcetera. Even the box looks nondescript. Yet Fields Of Arle is more properly understood as a Rosenberg boss battle — the game to play if you think you’ve got Rosenberg’s prior farm simulations mastered and you’re looking for a field-plowing, swamp-draining, church-raising upgrade. Unlike most Euros — even Loyang has special rules for four players — Arle can only be run as a duel. It’s also the rare worker-placement game that doesn’t give you an opportunity to expand your family of pawns: you begin and end the game with four pieces under your control. At first, it feels like there are a bewildering array of places to assign your workers, and a lovely assortment of animals to gather, things to grow, resources to convert, polders to dry, and handsome wagons (you get a garage to store them in!) to assemble to take your products to town. That board fills up in a hurry, though, and your opponent often has designs on the same scarce resources that you do. In practice, Fields Of Arle plays like a tense wrestling match where the upper hand is awfully elusive and your hold, such as it is, constantly threatens to slip. Chances are, no matter what farm-building strategy you opt for, you’ll be racing that wagon down to the finish line neck-and-neck with your competitor. This might be the best calibrated board game I’ve ever played: every mechanic, and there are many of them, feels perfectly balanced; no strategy feels overpowered, and every worker you place, or fail to place, sets off reverberations in perfect proportion to the move you’ve made. Fields Of Arle was published in 2014, and I don’t know where Uwe Rosenberg goes from here — this one seems like the ideal realization of all of the game development ideas he’s ever had, and his geographical and biological obsessions, too. Though apparently there’s a new one out where you’re a Norwegian shipbuilder in the fjords. An Arctic Circle farming simulation cannot be far away. #5. Ora Et Labora The third of the three Uwe Rosenberg titles on this list. I wrote about this one last year: it’s similar to Rosenberg’s other games, only it’s a bit longer and more relaxing (which isn’t to say it’s forgiving of mistakes) and instead of farming, you’re a medieval monk creating a diocese on your map. Our version of Ora Et Labora shipped with a pair of scenarios: last year we mostly played the French variant, and this year, we built our principalities in Ireland. There are different buildings in the two scenarios, but the main distinction is the way that the monks get drunk. The French version allows you to grow grapes for winemaking; the Irish game gives you the option between milling grain for beer or distilling malt for whiskey. I never quite got the hang of the resources necessary for a strong whiskey game, and it seems to me like a dead-end strategy. Then again, there’s something realistic about that. #4. Istanbul This splashy little race game incorporates my single favorite Eurogame element: it’s got a modular board. The playing area is assembled from sixteen rectangular cards representing different buildings, and unless you’re running one of the specific layout scenarios in the game booklet — which you won’t do after a very short while — you’ll shuffle them each game and play on a permutation that’s unique to your experience. You’ll hop around these spaces in order to gather resources that can be converted into rubies, and the first player with five rubies wins. Restrictions on movement force the players to calculate clever trade routes, but it’s not always apparent what the most efficient route between buildings might be. The action takes place in a fantasy version of Istanbul in which all resources are provided to you by swarthy male Turks and there isn’t a woman anywhere to interfere with your homosocial romance. Strange city!, but I’ve never been there. Istanbul plays quick and dirty, and once you’ve cracked the code to the board you’ve assembled randomly, play tends to accelerate toward an ending that you’ll probably see coming within the first ten minutes. American games usually allow trailing players to gang up and thrash the front-runner, but the narrow mechanics of Euros tend to discourage that kind of play. In Istanbul, it’s virtually impossible to stop the leader. Since this entire game is a mad sprint with the finish line perpetually in view, this is a real problem — at least for me. In general, Americans seem to like comebacks more than Europeans do; I don’t think we believe narrative tension is possible without the possibility of reversals of fortune. We like social mobility and uncertain outcomes. The Yankees notwithstanding, we find dynasties monotonous. Do you realize that only six different clubs have won the Premiere League championship? It’s true. No way would American sports fans put up with that. We need to believe in the possibility of going from worst to first. Otherwise the game feels rigged for the incumbents, and we lose interest. #3. Dominant Species Scythe is a standard Euro dressed up like a wargame. Dominant Species is just the opposite. Everything about it looks like it belongs to the geometric, dispassionate, abstract world of Eurogames: playing pieces are little wooden blocks and colored cones, the board has the antiseptic feel of a classroom aid, there are tiny cardboard chits representing resources on a terrain map, etcetera. Yet this is an actual, bonafide, ball-breaking wargame, albeit one that imports many of its game mechanics from Euros. There’s a worker placement phase, an area control element, a modular playing board, an exploration option, all stuff you’d expect to find in a cube-pusher, as they’re sometimes disparagingly called. The object of the game, however, is to take control of territory and blast your opponents off the board, as mercilessly as possible — and since you take the role of an entire phylum of animals in the perilous days before an Ice Age, there’s a feeling of raised stakes that a cardboard recreation of the Battle of Agincourt simply cannot supply. What’s both thrilling and horrifying about Dominant Species is the sheer number of obliteration mechanisms that the game provides. For instance, you can just go ahead and eat your competitors, or, if that’s not flashy enough for you, you can force them to regress on the evolutionary scale, or you can deplete their habitat of the resources they need to supply, or you can take control of the glacier (yes, there’s a glacier in this game) and ram it through the heart of their biome, or you can select a (literally) world-shattering event from a deck of cataclysms. After awhile of this — and Dominant Species does take a good long while — it begins to make ordinary army-driven wargames feel like hopscotch. The asymmetrical powers of the factions seem tiny at first, but the game systems are so well balanced that even minor variations are consequential in practice, and they do add Voyage Of The Beagle spice to the game: the bugs swarm and birds fly fast and spiders get aggressive and mammals sit smugly atop the food chain. More than anything else, it’s this immersive quality, rare in any game, that makes Dominant Species one of the very very best titles on our shelves. When I’m playing, I really do feel like I’m battling for survival on an inhospitable earth; I feel the advance of the ice and the dwindling resources in my habitat, and if, say, I develop a giant predator lizard that eats all the mammals, I can hear the flap of the wings of the birds as they scatter for safety to faraway hexes. The beautiful part is that the deep evolutionary theme is not drawn up cheesily with models or artwork (although the artwork here is, in general, good) — it’s generated by the same intricate, abstract game systems that power most of the best Euros. There’s no other game I’ve ever played that I can say that about. If you’ve got the time, and if you’ve ever enjoyed reading Darwin, this is highly recommended. #2. Trajan Uwe Rosenberg might be Hilary’s favorite game-maker, but the designer of her single favorite game — Castles Of Burgundy — is Stefan Feld. Feld, like Rosenberg, has a particular authorial stamp that’s difficult to miss; over the years, he’s refined his chosen mechanics to the point where it’s no overstatement to say that he’s mastered them. If you’re playing a Stefan Feld game, you can count on chain reactions: doing one thing that allows you to do something else, which in turn opens up the possibility of performing another action, and so on. 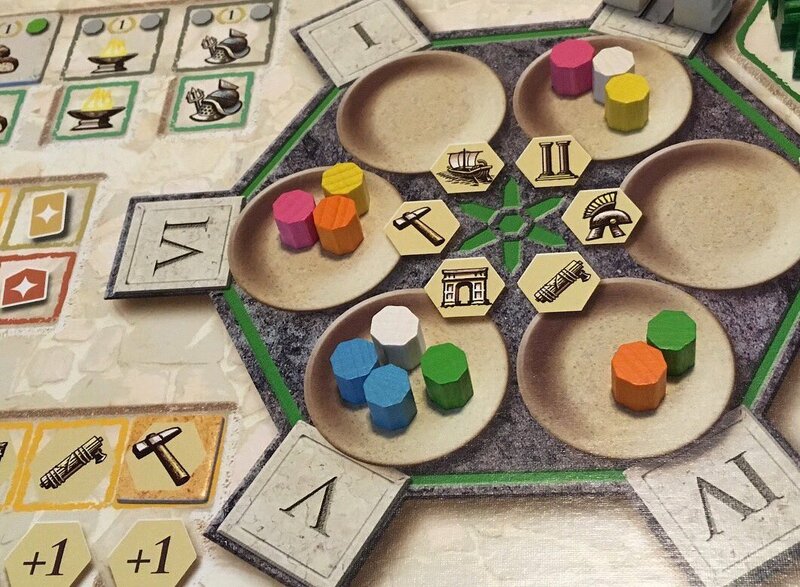 Trajan may or may not be Feld’s best game, but it definitely is the one where the chain reactions are the most consequential, and since the designer loves tipping over dominoes, this could be the best peek we have into his boardgaming soul. Nothing about Trajan looks very impressive: the action on the main board is broken down into a handful of minigames that are not, by themselves, very interesting. There’s one that’s straightforward area-control on a small map of Europe, and another that’s about collecting sets of cards, and another that’s a simple race up a track. In order to participate in those mini-games and score victory points, however, the player needs to move little colored pebbles around a series of pits on her player mat — and this is where Trajan gets subtly fantastic. Pit and pebble, or mancala, games have been around forever and nearly always provide brain-burning diversions. Shrewdly, Feld yokes this ancient engine to his series of minigames, and in so doing, he makes the whole board interlock like clockwork gears. It is fiendishly difficult to work the mancala, and you will spend most of the ninety minutes it takes to play Trajan in deep concentration, staring at your mat, fussing with the colored pebbles in a desperate attempt to hit upon the right combinations of colors that correspond to the optimal set of effects on the big board. It is a puzzle that never rests, and it will frustrate you. That said, when you drop the right pebble in the right pit and take the right action that allows you to make the move that triggers another action that opens up another scoring opportunity… well, let’s just say that electricity jolts through the circuit you’ve made, and lights up all your neurons at once. Although we didn’t start playing it until 2017, Trajan has been around for awhile, and it’s acquired a polarizing reputation. Some gamers call it a masterpiece, and others consider it a good example of everything that makes Euros feel like math homework. I understand some of the criticisms, and I can even sympathize with a few. The theme here, which has something or other to do with the Roman Empire, is absolutely tacked on and adds next to nothing to the experience. You, or more painfully, your friends, will occasionally be paralyzed before your mancala on your turn; there’s no way around this short of a chess clock. But I reject the notion that Trajan, and games like it, are multiplayer solitaire. All the mechanisms here are taut and well integrated and mutually dependent, and every decision you make affects the fortunes of all other players, powerfully. The surest way to lose Trajan is to keep your head down in your mancala and ignore what’s happening around you. Regardless of how you play it, your brain will be lit for the time it takes to run a game. That, alone, seems to me a good reason to give it a go. #1. Five Tribes The game we played the most in 2017 uses an adapted version of the mancala, too. But there are no pits in Five Tribes: just colored meeples on a modular board that you will pick up, one handful at a time, and drop one by one on adjacent tiles. Sets of different colored meeples trigger different effects and score points, and once they’ve all been played and retired to their drawstring bag — there are about a hundred meeples on the board — Five Tribes is over. Straightforward?, well, it is and it isn’t. Five Tribes is published by Days Of Wonder, a games company that puts a great deal of effort into crafting pretty components. The aesthetic over there skews young and glossy, but Five Tribes is meant to be a slightly more grown-up game than the usual Days Of Wonder title, so the art is over the top in a more adolescent-fantasy fashion than usual. Most of the playing pieces are carved out of wood and are pleasant to handle, including a clutch of replica palm trees and camel tokens in various colors and “palace” archways painted gold. Minaret pieces come in fuchsia and aqua and hot orange, and there’s a deck of large black-backed cards with images of different genies, each of which looks not unlike something you’d find on the cover of a Mercedes Lackey book. All of this fires my juvenile imagination, and helps me forget that Five Tribes is basically just a big open math problem. The point value of any given play on the board is easy for everybody to calculate — so there’s always an optimal move to make, and you may be gripped with the fear that you’re missing something obvious. This makes Five Tribes the rare game that slows down the more players know what they’re doing: novices will race through it gleefully, picking up meeples oblivious to consequences, but more experienced players will probably agonize over their turn, calculating and re-calculating their scores, worried that Miss Crabtree is about to give them a D. That hasn’t stopped us from playing it, a lot. But even after more than twenty games, I’m still not sure how good it is. Guess I’ll just have to keep on putting it to the test. Wanna play?